Are you working towards an important exam? We're here to help with a series of videos that pick out some top tips for studying and taking exams. When you're learning anything new, you're bound to make mistakes – and this is true when learning English. But there are different types of mistakes and how you deal with them depends on the type of error you've made. Watch this video to find out six top tips to help you learn from your mistakes. Then test your understanding in our quiz. Some mistakes are just slips. In speaking, these might not matter so much, you can self-correct or just continue speaking in most situations. In writing, you should proofread your work and look out for the typical slips and mistakes you make and correct them. However some slips might be more serious because they seem so normal to you that you forget that you've made them. You need to be careful with these. To start with you need to recognise when you’ve made this type of mistake. If you’re unsure, get a teacher or a friend to listen or read your work and identify where you've gone wrong. I think the best way to learn English is doing it without any fear for making mistakes! Next, keep a record of your mistakes – either by writing them in a book or making a recording of you speaking. You then have a list of errors to concentrate on. And later on, it's good to look back at this and see how you've improved. If you're making lots of mistakes, don't panic - it means you are learning lots of new language! Try to deal with correcting errors in a manageable way – bit by bit. Set yourself achievable goals to improve your English step by step. A final type of mistake is one you might make when you are trying to say or write something, but you haven’t learned the language to do so yet. 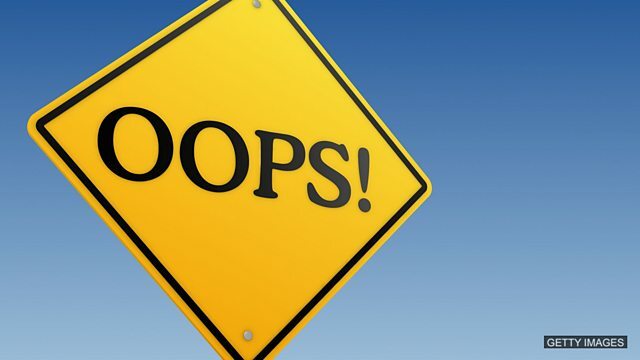 Don’t worry - these are great mistakes! They help you identify language you need to learn. You can then use these gaps to plan your studies or to make questions to ask your teacher. Just remember we all make mistakes - it's normal. But as long you learn from your mistakes or use them to improve your learning, you'll be fine. Good luck! How can you learn from your mistakes? When you make small mistakes while speaking, who can help you correct them? We learn by our mistakes! True or false: Learning English involves making lots of mistakes. It's about seeing your progress. Why should you keep a record of your mistakes? What should you do about the mistakes you make? Read about some common errors on this BBC Bitesize webpage. Read this interesting BBC News article about why typos and spelling mistakes don't really matter. Why not check out the rest of our Exam Skills series on our You Tube channel. Have you got any tips about learning strategies and exam preparation that you can share with us? Please email them to us at learningenglish@bbc.co.uk with 'Exam Skills' in the subject line. We will post our favourites here and on our Facebook page. Please note that we can’t reply to individual emails, but we do read all of them. Next, join us for News Review, where we'll bring you key words and phrases from the latest stories and show you how to use it in your everyday English.